A new species of tube anemone Ceriantheopsis austroafricanus n. sp. is described from shallow waters in the vicinity of Cape Town, South Africa. This represents the first report of a benthic cerianthid from South African waters. The cnidom and anatomy of other known species of Ceriantheopsis Carlgren are compared with those of the new species, the distributions of the species are mapped and a key provided to their identification. Keywords: Ceriantharia, Ceriantheopsis, South Africa, new species. Ceriantharia, or tube anemones, are one of the least-known groups of anthozoans in South Africa. Although they are large, conspicuous organisms that have been well known to, and indeed regularly photographed by, amateur divers for decades, very few specimens have found their way into scientific collections. This can be attributed to their habit of retracting deep into their burrows at the slightest disturbance, following which they are extremely difficult to extract and collect using conventional sampling gear. To our knowledge only two records of cerianthids, both of planktonic cerianthid larvae, have thus far been reported from South Africa in the scientific literature. Larvae of Cerianthula multiseptata Leloup, 1964 (Botrucnidiferidae) were recorded from the Agulhas Bank off Port St John's by Leloup (1964) and those of Anactinia pelagica Annandale, 1909 (Arachnactidae) were collected at 34°09'S, 24°59.4'E, near Jeffrey's Bay, by Carlgren (1924). Several species of benthic cerianthids and their planktonic larvae have, however, been reported from adjacent regions. Pachycerianthus maua (Carlgren, 1900) has been recorded from a reef off Madagascar (Emig et al. 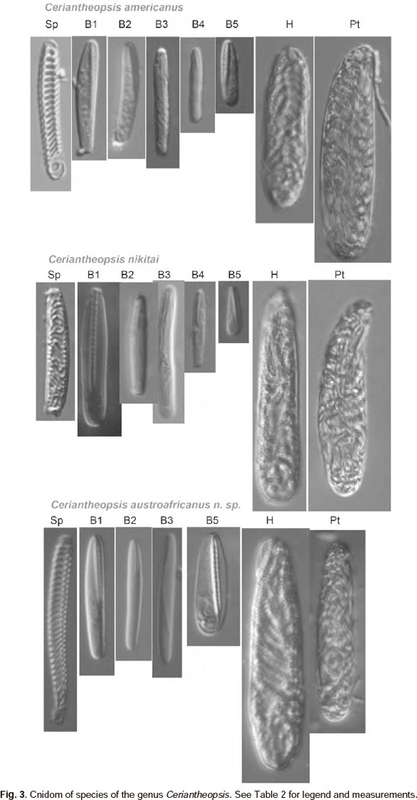 1979; den Hartog 2002) and three species of cerianthids, namely Ceriantheopsis nikitai Molodtsova, 2001, Cerianthus malakhovi Molodtsova, 2001 and Botrucnidifer shtokmani Molodtsova, 2001 have been described from Namibia (Molodtsova 2001a, 20016, 2001c). Anactinia pelagica was also reported from the open ocean southwest and west of Madagascar by Carlgren (1924). No cerianthids were included in the analysis of the distribution patterns of South African sea anemones by Acuna & Griffiths (2004). The present work thus represents the first official report of a benthic adult cerianthid from South Africa, although unnamed species have previously been depicted in popular regional field guides (Jones 2008; Branch et al. 2010). Cerianthids were photographed in the field and then manually dug from the substratum by divers using scuba, after which they were preserved in 9% seawater-buffered formalin. For study of the arrangement of mesenteries, preserved polyps were dissected longitudinally, laid open, and fastened with pins to a paraffin-wax plate. The nematocysts were studied by means of squash-preparations, using a magnification of X1000 with oil immersion, and measured with a Camera Lucida. Cnida terminology follows that of Mariscal (1974) and Mariscal et al. (1977). All measurements, both of the whole animals and cnida, were carried out on preserved material. Specimens of the new species have been deposited in the Iziko South African Museum (SAM), Cape Town, the Zoological Museum of Moscow State University (ZMMU) and CollectionofP.P. Shirshov, InstituteofOceanologyRAS (IORAS). For comparative purposes the arrangement of the mesenteries and cnidom of C. americanus (Agassiz) (USNM No. 51243: Alligator Harbor, Florida; March 27, 1957 Coll. W.G. Hewatt - 2 specimens) and C. nikitai Molodtsova (IORAS No. IV-9-Cer-11-004: RV 'Akademik Mstislav Keldysh' 43 cruise, St. 4927: 25°07'S 13°53'E, 200 m, January 19, 1986) were also studied. Cerianthids with alternating sterile and fertile mesenteries. Second protomesenteries fertile, reaching aboral pole. Metamesenteries arranged in mBMb. Length of all but M-metamesenteries diminishes toward multiplication chamber. Length of M-metamesenteries of first 2-4 quartets can increase toward the multiplication chamber. M3 and further mesenteries can diminish towards multiplication chamber (Carlgren 1912). Ceriantheopsis americanus (Agassiz in Verrill, 1864). Large cerianthid with about 70 tentacles each in marginal and labial cycles. Marginal tentacles relatively short, when preserved about the same length as labials (1.2-1.4 cm), but thicker at the base: 1.5 and 0.9 mm, respectively. Oral disc wide, distance between marginal and labial tentacles up to 1.5 cm in preserved animals. Tentacles of each group arranged in four pseudocycles. Unpaired labial tentacle present. Arrangement of labial tentacles (3)423.4232.4312.4312. Three pairs ofmesenteries attached to wide siphonoglyph. Hyposulcus prominent and narrow in the lower part; hemisulci present. Directive mesenteries sterile, long, up to half of siphonoglyph, without mesenterial filament. Second protomesenteries reach aboral pole, bearing short ciliated tract with aborally-arranged bundle of craspedonemes, followed by very short cnido-glandular tract and long (~85% of the mesentery) craspedion tract. Third protomesenteries sterile, few millimetres longer than directives. Ciliated tract along about half of total mesentery, with craspedonemes, more numerous at lower third, following by closely packed cnido-glandular tract. M and m-meta-mesenteries long and fertile, of same structure as second protomesenteries. M-mesenteries longer in each quartet, with longest mesenteries M2 and M3. B- and b-mesenteries sterile. B metamesenteries with same structure as third protomesenteries, but shorter; b-mesenteries slightly shorter in each quartet, with shorter ciliated tract with bunch of craspedonemes and more developed cnido-glandular tract. Cnidom. Spirocysts, b-rhabdoids, holotrichs and ptychocysts as shown in Table 2. Colour. At least three colour variations reported from False Bay and adjacent area (Fig. 1). These are: (1) violet marginal and labial tentacles, fleshy oral disc with radially arranged brown stripes, (2) uniformly fleshy coloured outer marginals, labials and oral disc, with wide brown bands at the base and tips of inner marginals; (3) uniformly fleshy coloured outer marginals and oral disc, inner marginals violet, labials brownish with violet tips. Table Bay Docks, about 12 m depth in soft sediment; False Bay 6.5-25 m in sand and gravel. Animal elongated, cylindrical; 14.5 cm long, diameter 2.2 cm just below marginal tentacles and 1.1 cm near the base. Marginal tentacles short and stout in preserved condition, ~80 in number, arranged in 3-4 pseudocycles, highly contracted, 1.0-1.2 cm long and 1.0-1.3 mm in diameter near the base, brownish, distinctly lighter then general colour of column. In fresh material it was possible to see darker spots near bases of marginal tentacles of inner pseudocycles but these have subsequently faded away after several years of preservation. Labial tentacles 80 in number, about 1.5 cm long, apparently of same colour as marginals ones, but without spots; Directive labial tentacles present. Arrangement of labial tentacles: (3)423.4232.4312., etc. Oral disk 9 mm wide. Stomatodeum 2.3 cm long, of the same colour as inner labial tentacles. Siphonoglyph wide, 8 mm wide with six mesenteries attached. Hyposulcus 4 mm long with developed hemisulci 3 mm long. Free part ofdirec-tive mesenteries 2.8 cm long, without mesenterial filament. Second protomesenteries (p2) reach aboral pole and with developed mesenterial filament: 2.3 cm - ciliated tract with about 10 long craspedonemes (up to 1-2 cm long) developed at base, short (~3 mm) feebly developed cnido-glandular tract and craspedion. Free part ofthird protomesenteries (p3) about 3 cm long with developed filament: ciliated tract ~5 mm long with developed craspedonemes, cnido-glandular tract ~ 10 mm long. Metamesenteries in quartets: mBMb. In the first quartet m-mesenteries have free part ~7 cm: ciliated tract ~2.3 cm with bunch of long craspedonemes attached aborally, cnido-glandular tract absent, craspedion. M1 about the same structure as m1, but 1.5 cm longer. B1 with length (2.6 cm) and morphology close to p3: short ciliated tract (4 mm) with uniformly arranged craspedonemes and densely packed cnido-glandular tract (~1 cm); b1 a bit shorter (2.2 cm) with shorter ciliated tract (~1 mm). In next quartets length of all but M mesenteries diminish towards multiplication chamber. Length of free part of M-mesenteries of next two quartets increases (M1<M2<M3=M4=M5) and beginning of sixth quartet of metamesenteries diminishes toward multiplication chamber. Cnidom as shown in Table 2. All specimens studied showed uniformity in general arrangement of the labial tentacles and mesenteries. Some variability was found in the arrangement of the labial tentacles close to the directive chamber: ((3)423.4232.4312.. (2)423.3132.4312...). In one paratype (ZMMU No. Ec-105) the M-mesenteries of the second quartet of mesenteries were longer than those of the third, but the M-mesenteries of the fourth quartets were the same length as M2 and reached the aboral pole. Damaged specimen (IORAS No. IV-9-Cer-11-005) is characterized by an extremely wide oral disc, reaching 1.5 cm in diameter. Table Bay, False Bay 8-15 m.
Two other species are known in the genus Ceriantheopsis: C. americanus (Agassiz in Verrill, 1864) and C. nikitai Molodtsova (Table 1). Species apparently cannot be easily distinguished by their colour, as this seems to be highly variable in cerianthids. C. austroafricanus sp. 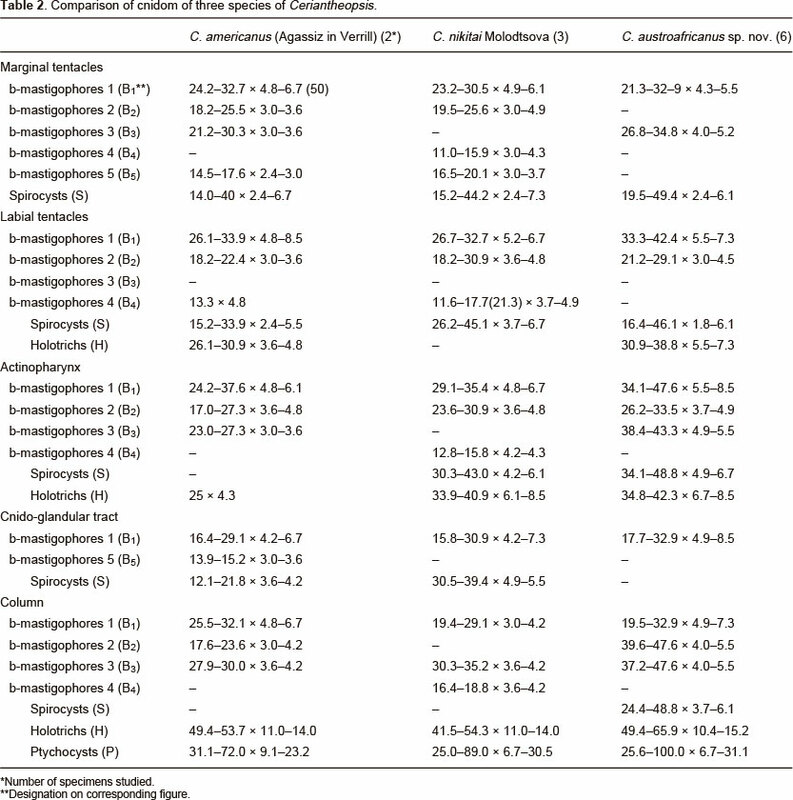 nov. resembles C. americanus in its relatively short marginal tentacles, in the cnido-glandular tract at M and m mesenteries of first quartets and in having different structure of Band b-mesenteries in each quartet (Table 1). However, C. americanus can be distinguished from the new species by its characteristic slender, vermiform body, very narrow siphonoglyph and very long cnido-glandular tract on b-mesenteries. In contrast to other two species C. nikitai has a more stout appearance with long marginal tentacles, that can reach about 20% of the body length in preserved animal, and has b- and B- metamesenteries that differ only in relative length in each quartet. The new species, C. austro-africanus sp. nov. thus differs from C. americanus by its less elongate body and from C. nikitai by its short marginal tentacles, that in preserved state can be shorter than labials. 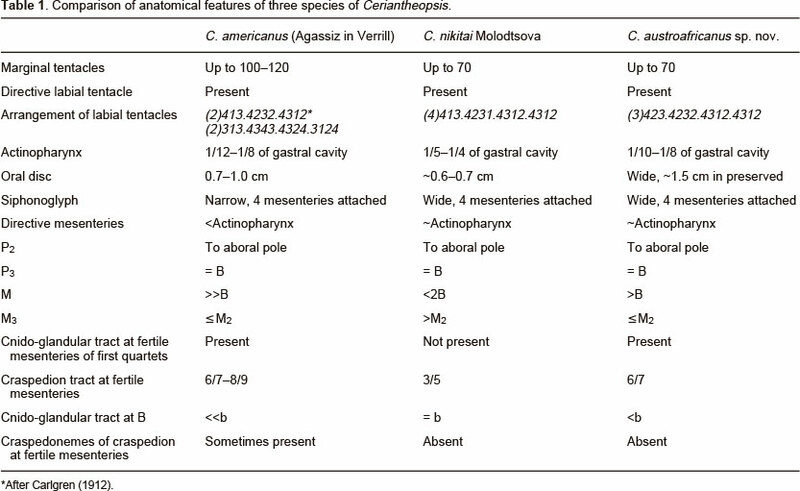 Also the three species of Ceriantheopsis can each be distinguished by their characteristic cnidom (Table 2, Fig. 3). The cnidom of the new species is similar to that of C. americanus (Agassiz in Verrill), but the latter has much smaller b-mastigophores 5 in all regions studied. 2a Region of cnido-glandular tract at B-mesenteries the same length as at b-mesenteries in each quartet. Craspedion region at fertile mesenteries not longer than 60% offree part ofeach mesentery. Actinopharynx up to 25% of gastric cavity .... C. nikitai Molodtsova 2b Region of cnido-glandular tract at B-mesenteries shorter than at b-mesenteries in each quartet. Craspedion region at fertile mesenteries up to 85% of free part of each mesentery. Actinopharynx not more than 12% of gastric cavity ...................... C. austroafricanus sp. nov.
All three known species of the genus Ceriantheopsis are restricted to the Atlantic Ocean. Ceriantheopsis americanus (Agassiz in Verrill) is known from mud flats along the Atlantic coast of the United States from Rhode Island southwards to the Eastern part of the Gulf of Mexico. The other two species are restricted to the South-East Atlantic: C. nikitai Molodtsova has been reported from several localities between 18°S and 25°S, South to the Walvis Ridge, while C. austroafricanus sp. nov. is to date known only from False Bay and Table Bay in the vicinity of the Cape Town, although anecdotal reports by amateur divers suggest that the actual distribution may be far larger. Such a distribution pattern of the genus, including two different species in the South-East Atlantic and one more species in North-West Atlantic, with no additional records of the genus, is characteristic for Indo-West Pacific invaders that migrated around southern Africa (Vermij & Rosenberg 1993). No proof for this hypothesis can be provided, as cerianthids have no skeletons and are not really known from fossil records. The only putative fossil cerianthid, Kuibisia glabra (Hahn & Pflug, 1985) cannot be identified even to family level. It is thus quite possible that the genus occurs in other regions, such as the Indian Ocean and South-West Pacific. Most species are known by original descriptions only and identifications in regional field-guides cannot be considered reliable, as they are based mostly on colour photographs made during scuba dives. Unfortunately, photographs can be used only to determine Ceriantharia to the subordinal level. More species can be expected in the region. Because of the earlier report of larvae Cerianthula multiseptata (Leloup, 1964) and Anactinia pelagica (Carlgren 1924) in the plankton off South Africa, benthic adult representatives of at least these two families, Botrucnidiferidae and Arachnactidae, can be expected. Our thanks go to Peter Southwood for collecting and photographing the specimens from False Bay and to Allen Collins and Stephen Cairns (USNM) for material of Ceriantheopsis americanus for comparative cnidae studies. Financial support was provided though a grant to Charles Griffiths from the SEAChange Programme of the South African National Research Foundation and the first author was partly supported from RFBI 09-05-00868a.